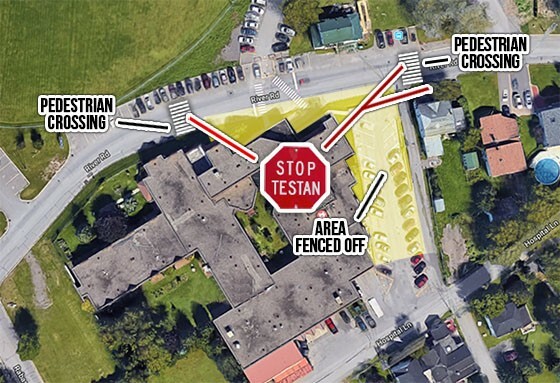 The Public Safety Unit of the Mohawk Council of Kahnawake wishes to inform the road users that the section of River Road in front of the Kateri Memorial Hospital Centre (KMHC) will be closed tomorrow (Tuesday, September 18th) to reconfigure the jersey barriers in preparation for phase three of the KMHC expansion project. The new configuration will allow for two-way traffic and the removal of the traffic light currently in place. However, the two stop signs will remain at the crosswalks and must be respected for the safety of pedestrians. Further, a section in front of the current Clinic entrance and the east parking lot will be fenced off, and the parking area that was used as a covered pedestrian walkway between buildings will be restored (see map below). Road users are cautioned to show extra vigilance when approaching any worksite. For further information about the new traffic configuration, please contact Director of Public Safety Arnold Lazare at 450-632-0650.